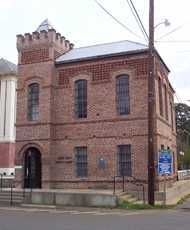 Sabine County Jail, Hemphill, Texas, Recorded Texas Historic Landmark. 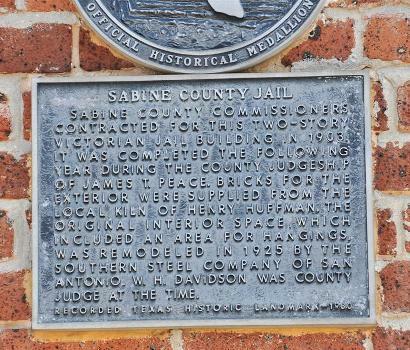 "Texas’ oldest remaining gallows, still in place after nearly 100 years, is in the four-cell jail of the Sabine County Jail in Hemphill. The gallows, however, haven’t been used in eighty years." 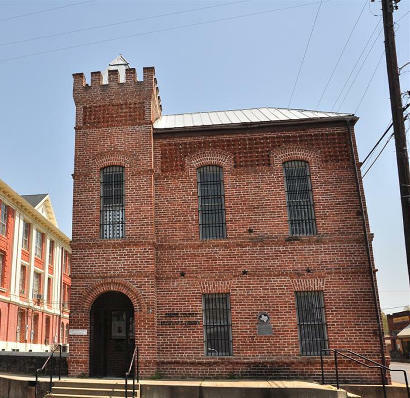 Sabine County Commissioners contracted for this two-story Victorian jail building in 1903. It was completed the following year during the county judgeship of James T. Peace. Bricks for the exterior were supplied from the local kiln of Henry Huffman. The original interior space, which included an area for hangings, was remodeled in 1925 by the Southern Steel Company of San Antonio. W. H. Davidson was county judge at the time.